Matches between Arsenal and Liverpool basically guarantee drama, excitement and goals. Pundit Arena counts down the ten best matches between the two sides in the build-up to Liverpool’s trip to the Emirates this Saturday. The Arsenal defence could not cope with Peter Crouch on the day, as the England striker scored a perfect hat-trick. William Gallas’ consolidation goal was unable to inspire an Arsenal comeback, with Crouch’s right foot, left foot and headed goals sealing the three points for Liverpool. Theo Walcott’s brilliant run set up Emmanuel Adebayor to make the score 3-3 on aggregate in this Champions League quarter-final, and with Arsenal heading through on away goals, Liverpool needed a hero. The Dutchman was brought down by Kolo Toure to allow Gerrard to fire in from the spot, before he raced away to make it 4-2 in stoppage time. The somewhat unlikely figure of Julio Baptista was Arsenal’s hero at Anfield, scoring four times and also seeing a penalty saved by Jerzy Dudek. Rafael Benitez’s Liverpool threatened a comeback with goals from Steven Gerrard, Sami Hyypia and Robbie Fowler, but Jeremie Aliaderie, Alex Song and four from Baptista sent Arsenal through to the next round in a nine-goal thriller. 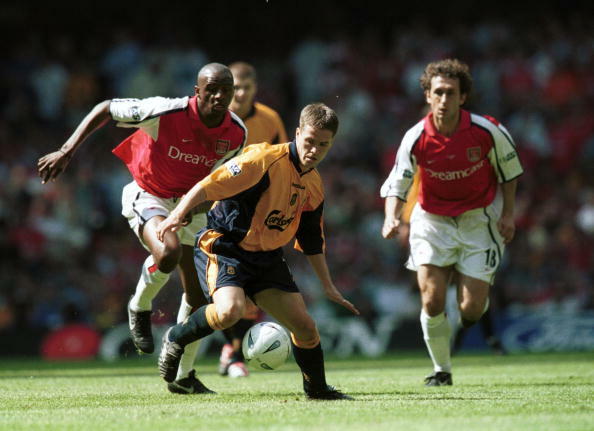 Arsenal dominated Liverpool for 83 minutes of the FA Cup final in Cardiff, but only had a Freddie Ljungberg strike and their loud howls of derision following Stephane Henchoz’s infamous goalline handball to show for it. Enter 21-year-old Michael Owen, who scored two expertly-taken goals and earned a place in cup final folklore. 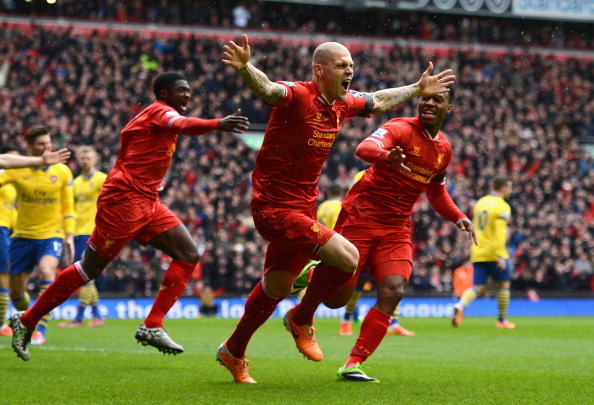 Martin Skrtel, 1-0, 1 minute. Skrtel, 2-0, 10 minutes. Raheem Sterling, 3-0, 16 minutes. Daniel Sturridge, 4-0, 20 minutes. The utter madness of that blistering Liverpool opening stunned the Gunners, who had no answer to their hosts. Sterling grabbed another one, with Arsenal’s only reply coming from a Mikel Arteta penalty. Liverpool’s awesome attack, including Luis Suarez at his best, would put up a convincing fight for the club’s first ever Premier League title that season before a 3-3 draw at Crystal Palace and Steven Gerrard’s infamous slip resulted in a late collapse and the Reds conceding the title to Manchester City. Liverpool took a 2-1 lead at Highbury which threatened Arsenal’s record of going unbeaten for the full season. However, two goals from Thierry Henry, including a brilliant solo goal, inspired Arsenal to victory. Arsenal would go on to win the Premier League that season and their unbeaten run lasted 49 games. Robbie Fowler scored a hattrick against Arsenal in just four minutes, 33 seconds in the third season of the Premiership, as it was known then. 19-year-old Fowler announced himself to Anfield in spectacular fashion and would go on to score 128 goals for Liverpool. 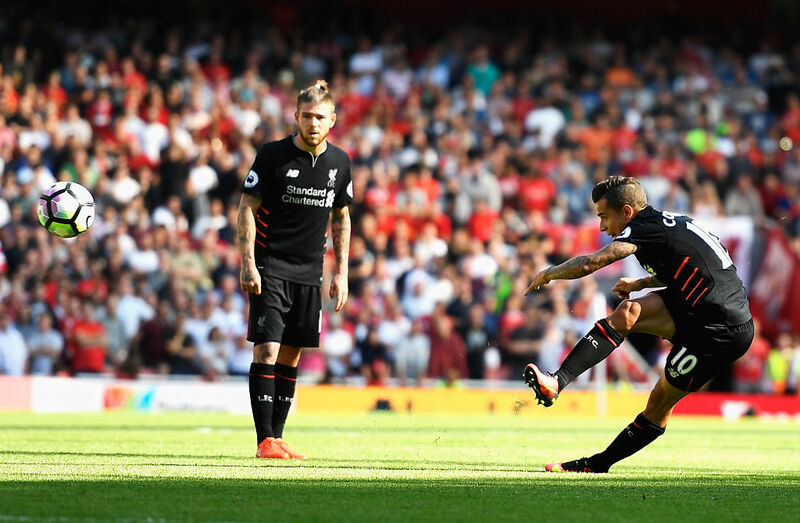 Theo Walcott opened the scoring for Arsenal before goals from Adam Lallana, a debut screamer from Sadio Mane and two from Philippe Coutinho including a stunning free-kick put Liverpool 4-1 up. Goals from Alex-Oxlade Chamberlain and Calum Chambers brought the deficit back to one but Arsenal were unable to find an equalizer in an extraordinary seven-goal thriller. Liverpool needed a win to keep pace with Sir Alex Ferguson’s Manchester United. There was only one goal in the first-half, before a simply ridiculous second-half ended Liverpool’s title hopes. Andriy Arshavin’s four goals should have won Arsenal the points, only for Liverpool to keep coming back thanks to braces from Yossi Benayoun and Fernando Torres. In a game that most younger football fans will not recall, nothing less than a 2-0 win at Anfield against the reigning champions would suffice for George Graham’s Arsenal in the final game of the 1988/89 campaign. Liverpool were top of the league going into the game, three points clear of Arsenal in second, with a two-goal advantage over the Gunners. Liverpool hadn’t been beaten by two goals at Anfield for three years. Arsenal hadn’t won there for 14. Yet, Alan Smith’s goal early in the second half gave the Gunners hope, but with a minute left, time appeared to have run out. That was until the Gunners streamed forward in the dying seconds and, from Smith’s lobbed pass, midfielder Michael Thomas dinked the ball wide of Liverpool keeper Bruce Grobbelaar to grab the vital second goal. It was an incredible finish to the season that arguably surpasses Aguero’s title-winning goal for Manchester City in 2012 in terms of drama. Arsenal had pipped Dalglish’s FA Cup-winning team to the title, thus ending their 18-year title drought. The games that missed out on the top 10 include Arsenal’s 4-1 victory in 2015, the 3-3 draw in 2016 and Liverpool’s 4-0 victory last season. If these games are anything to by, Arsenal v Liverpool at the Emirates Stadium on Saturday at 5:30 will not be one to miss.